Picture from Australia, kindly sent by Rodney Deworsip, from a gathering dance held for Dr. Mario D'Cruz in October first week, 2002. Request from Rodney to please pass this picture around to friends. Thanks , RJ. Hi Guys, check out This Surprisefor the New Year! Hi Guys, check out anotherThis Surprisefor the New Year '99! Wishing all Old Boys of St. Joseph's around the World and at home and their Families a Blessed Christmas and a Joyful New Year 2002, from Ronnie, Maisy, Andrew and Joanne and also from all the Old Boy's still at Bangalore. AS I WILL NOT BE DOING THE "OFFICIAL" OBA HOMEPAGE, I REGRET THAT I CANNOT INCLUDE UPDATES AND THE "GOODIES" THAT I USUALLY PUT ON THIS PAGE, BUT WILL YOU WILL HAVE TO WAIT TO GET THE SAME WHEN THE 'OFFICIAL' OBA PAGE IS OUT, SO JUST HANG IN THERE AND PRAY THAT IT'S OUT SOON. Cheers, Ronnie. That was in 1999, till date the OBA although in earlier AGM's have noted that I would be part of the 'Web Page Team', have never called me to any meeting nor have their taken any of my ideas or help, henceforth, I will be updateing my own page and you will be receiving all the 'goodies' from time to time, whenever I have access to the net (since I am not on it at present) through some kind soul's good offices!! It's now October 2002!! FLASH: Alan MacBride (80) passed away on 7th November 1998, at Bangalore. This letter comes to you at an unusual time and on an unusual theme. it has been necessitated by the recent socio-political trends in our country which have caused anxiety and alarm in the minority communities in general and in the Christian community in particular. You are aware of the significant, contribution the Christian educational institutions have rendered to the development of our country and its people - without distinction of caste or creed. EEminent leaders in all walks of life have, on innumerable occasions and on public platforms, expressed their sincere and unqualified appreciation for the dedicated service of these Christian institutions. I am sure that you yourselves, with your 'first hand' experience of our institution, have come to the same conclusion. Nevertheless, some ill-motivated fundamentalist groups have, in the past few months, made all sorts of false accusations against our institutions such as propagating an alien culture, proselytisation and even conversion! In our own state of Karnataka, why right here in Bangalore city itself, these misguided elements have harassed and threatened the managements of some of our educational institutions. What is worse, the Government itself, by its inaction, seems to tacitly abet these crimes and misdeeds. In this context the Christian community of Bangalore has decided to hold a Peace Rally on Wednesday, 11th November 1998 at 11.30 a.m. at St Joseph’s Indian High School grounds (next to Mallya Hospital, near Kanteerava Stadium). The purpose of the rally ia (a) to draw the attention of all right-thinking people to the unfair accusations and unjust attacks on Christian institutions; (b) to persuade the Governments, both Central and State, to protect the constitutional rights of the minorities and to reverse the trend of victimization of personnel dedicated to the service of others; and (c) to uphold the time-honoured traditions of religious and cultural pluralism in our country. This is the time we most need your support and cooperation. You know that in standing by us in this hour of need, you will demonstrate not only your genuine appreciation for the service, we are rendering to our people, but also your own commitment to the cause of education. Let us face together the challenge of fundamentalism and build up a glorious future for our children. Fr. F. D’Almeida, s.j., Principal, St. Joseph’s Evening College, Bangalore. Fr. E. Lobo. s.j., Principal, St. Joseph’s Arts & Science College, Bangalore. Fr. J. Nelapaty, s.j., Principal, St. Joseph’s College of Commerce, Bangalore. Fr. Micheal John, s.j., Principal, St. Joseph’s Boys’ High School, Bangalore. This to inform all Old Boys that Mrs. Dorothy Alverez, wife of Alec Alverez, and old Teacher of St. Joseph's Boy's High School, passed away at around 12.30 noon on 10th February, 1998. Information received from Joe D'Mellow relayed by Mrs. Marianne deNazareth. The funeral arrangements will be at 9 a.m. on Wednsday 11th, February, 1998. Condolence Messages may be sent to Alec Alverez, at my e-mail address : ronniejohnson@hotmail.com or Gregory de Nazareth till other arrangements are made. Alec Alverez's Phone: 091 80 5587331, Please check out the Condolence and Tributes sent in. Reply from Mr. Alverez, to the e-mail condolences is posted on the O.B.A. Tribute Page, so please check out. Urgent Call from OBA UK Branch, PLEASE READ, AND ACT! Take a Visit Back To School! The Good Old Days! Links to International OBA Home Pages! Waiting for Pages to come up! Links to St. Aloysius College! Mangalore where Fr. E. Jacques was a Rector! Hey Guys, need some info on Bro. Calligaro, someone please send me. This is Jim Zachariah, an old boy. Its good to know that someone like you volunteers his time to keep the OBA spirit burning by maintaining a webpage like this for all the good info. Good job! Also, I'm in touch with Br. Calligaro (affectionately called Callu by boarders) and I recently got a letter from him saying he was injured quite seriously in an accident (he didn't say what accident). He said he was recovering well but slow. Let everyone who knows him pray for him. He's a great man of God and I've never seem anyone so devoted and energetic about his work like him. I was a boarder all my school life and I know how much he helped us. Amazing Italian! We always have a shot of wine everytime we meet! :-) He's the same good ol' Callu like we always know him to be. Hope this info. helps. I'll be getting in touch with Jimmy pretty soon about hosting this year's OBA get-together. THE SCHOOL IS NOT MOVING! 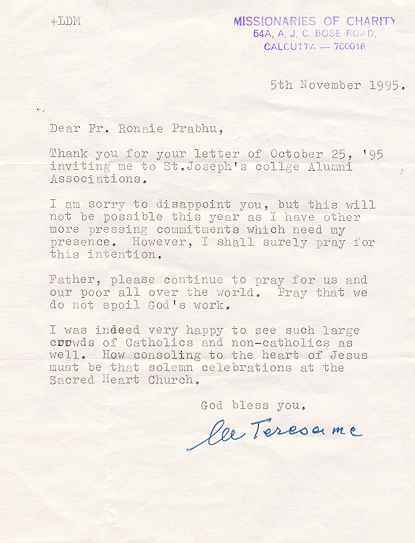 We give below a letter from Fr. Ronnie Prabhu regarding the shifting of the School, it would be nice if you could put in on the Net. FULLY NEW, BUT JUST LIKE THE OLD! Since the past four years or so we have been hearing rumours that our dear St. Joseph’s Boys High School was shifting from its present hallowed premises. There have been lots of enquiries. Many of them anguished and painful. “But why should if shift”? “How could it ever be the same elsewhere?” How can these strong old arches & pillars which have the history of generations of us written in their hearts, ever be replaced ? etc. One Old Boy on a visit told me he lovingly walked along the corridors, affectionately touched the walls and furniture of the classrooms, reverently stood on the Grounds facing the age old edifice “ perhaps for the last time” ! The question of one or other institution shifting from the main St. Joseph’s Campus has been discussed since several years. The question arose because there are 2 institutions on one campus: the Section with its 3000 students, learning 24 different subjects with ...... laboratories, has a ground area of 2.5 acres and feels cramped with very little moving space. The College needs more class rooms, more office rooms, more staff & seminar rooms, but just doesn’t have place to build. The School is a little better off so far as space is concerned: about 5.8 acres but with a building constructed over a hundred years ago. It has many class rooms, originally meant of 25 students now having to take in even 60 along dark & dingy corridors, with no rooms for any expansion or modern facilities. The School building does look strong but in some places along the wings has developed serious cracks. The solution to these two problems, we felt , was that one of the institutions should move out of the campus. Since the College, if relocated would need almost thrice the area of the School and involve thrice the heavy expenditure it was plain that the School should move out, and some four years ago it was actually decided that the School would move to the Grounds near the Hostel - while the College would take over the present School premises adapting the building for its purpose. We kept mulling over this decision for some time and then we even began working on plans. The first set of elaborately worked out plans had to be discarded as unsuitable for our needs as also our affordability. Meanwhile a new factor emerged about a year ago with the Government seriously considering the proposal of bifurcating all composite Colleges into degree Colleges and PUC Colleges. This bifurcation, though required by the UGC, involves very serious difficulties, and it always seemed as though Government would never actually effect it. But now that the Government began studying the problem seriously it became clear that St. Joseph’s too would soon have to be bifurcated into 2 Colleges - a PUC College and a degree College, each with its own principal, staff, office and hopefully, for smooth running, independent premises. This necessitated a reconsideration of our reorganization plan, to allot premises for an independent PUC. We once again reflected & prayed over this problem to discern how God wanted us to proceed, and Superiors have taken the following decisions. 1. The degree section of the College will move to the Grounds near the Hostel. It will take over the Hostel building which with minimal interior adaptation can be used as laboratories etc. 2. The Hostel will move to a part of the MG Road Grounds. The rest of the Grounds will continue to be at the disposal of the School. 3. The present premises of the College will go to the PUC (which will eventually be an independent junior College). 4. And now the most important point : the School will remain on its present premises. Only, since its class rooms are too small & dark, and since cracks have appeared on the wings of the old building, we will have to rebuild the School. So keeping the same outer appearance of the present century-old structure, we plan to rebuild the School part by part - the work will take around 3 years once we begin. Plans are already being though out. Bangalore is lucky to have a good Urban Arts Commission which insists on preserving the heritage of Bangalore while putting up something new. We plan to build in such a way the new will look just like the old! Our first plan was to retain the ground floor which appears pretty strong, as it is, but knock down the leaky rickety roof and the walls of the first floor (they are mud walls) and rebuild the first floor into spacious class rooms (keeping the same outer appearance. But since there is reason to believe that though the ground floor is strong it isn’t strong enough to last another sixty years, it will be wiser to knock down the whole building part by part and rebuild. Readers ‘ suggestions are welcome, they must come fast. All this is going to be heavy expenditure. But what we do, we should do well without, of course, being extravagant. We feel a sense of confidence because God has blessed us with lots of friends : OLD BOYS, parents who will do anything for their Alma Mater. We, the OBA Committee are please to inform you that the OBA Calling is ready and will be sent to you shortly. At this year's AGM it was decided that the subscription scheme for the Calling can be abandoned due to the very poor response. Only 150 subscriptions were received. It was suggested at the AGM that the old boys themselves get Ads to support the OBA Calling. Asyou are aware, the Calling has become expensive to print and post. It is eating into the OBA budget and urgent measures are needed to prevent the Calling from becoming a part of history. We kindly request you to help us in our endeavour to preserve the Calling by either advertising in the Calling or getting Ads. We hope that you will come foreard to help us. Back Page: Rs.5000/-, Inside Back/Front: Rs.3000/-, Full Page: Rs.1000/-, Half Page: Rs.500/-. Sorry Guys, Fr. Hedwig's message seems to have got lost somewhere, anyone got a copy? Thrilled to hear you've set about fulfilling a long cherished dream, getting together Old Boys in the US. On behalf of the School I express my deep gratitude to you and ask God to abundantly bless your efforts. Jimmy, some day the School will have to move to better premises but the old building will not be pulled down, so far I can see, as it is very strong, particularly the ground floor. The roofing of course will have to be renewed some day as it is in bad shape. The lastword about the whole Reorganization of our campus has not yet been aside; we are awaiting directions from our Superior, but the long-range good of each institution will be certainly kept in mind. I appreciate very much your saying "we are here to support, not to fight". I thank God for giving us so many Old Boys who are so keenly interested in their Alma Mater. Once again may your interest and effort bear much fruit. Sd. Fr. Ronnie Prabhu, s.j. I am delighted to hear that you are preparing for the first ever meeting of the Old BOYS in the U.S. on the 25th of May '97. I am very happy to send you my warmest greetings on this historic occasion. If you are planning to form a U.S. Branch of the OBA and I am sure you will, it will be one of the youngest branches but I am confident in the years to come it will be one of the strongest. May this branch grow and flourish. As we are heading towards the next Millennium your Alma Mater is getting ready to face new challenges. We need your active support in the re organization plan in the coming years. sd. Rev.Fr. Michael John s.j. St. Joseph's - An Institution! The Golden Jubilee Celebrations of St Joseph's College Hostel was inaugurated on Saturday, 17th May 1997, by the former Director General of Police Nizamuddin and past Wardens of the Hostel. Contributions of the past Wardens were recollected and Fr. Louis Mascarenhas (now in his 90's still spritely shuffles around the perimeter of St. Joseph's School on the busy Musuem Road), Fr. Rebello, Fr. Julian Fernandes were honoured on the occassion. Rich tributes were paid to late Fr. Valerian Ferroli. Tracing the origin of the Hostel, present Warden Fr. Hilary Pereira said that students of the Hostel have occupied high places in various walks of life. Students from all parts of the country and particularly those from rural Karnataka are admitted into the Hostel without any discrimination he added. Renowned Film Director and Distributor M. Bhaktavatsalam who was a ward of the Hostel in 1949 and Mr. Nizamuddin who was the stuident of St. Joseph's College during the same period quoted various anecdotes to explain the atmosphere at the College and the Hostel which was conducive for overall development of the students. Mr. Nizamuddin released a sovenir brought out on the occasion. Mrs. Lakshmi Nizamuddin distributed prizes to the students for their achievement in various disciplines. Fr. Ronnie Prabhu was also present on the occasion. The St. Joseph's College Hostel was started in 1937 to accomodate the needs of students who hailed from distant areas. I sent a message for the Les Vagas "bash up" and handed it over to Joe D'Mello on the 19th to be faxed to you. Our dear old students and their families gathered at Las Vagas. We send you our warmest wishes for a happy and successful meeting. At long last Jimmy's efforts have borne fruit. He must be a very happy man today. We hope you can revive memories of the enjoyable and care free days spent at St. Joseph's - the Midnight feasts in the domitory, the surreptitions bunking so frequently indulged in by the boarders. the sudden failure of the lights in the study hall due to short-circuiting by mischevious elements, the games on the school quadrangle, the walk to and from New Field, the deary and airless class rooms, the boring lessons you had no option but to attend, the idiosyncrasies and mannerisms of the staff whom you would probably do your best to imitate - and many more incidents which only you could re-call. All this in the laid back and one horse town of Bangalore of yore. We trust you spend an enjoyable week-end catching up with old friends and may this unique fellowship continue in the future at different venues. Chandra Mohan's quiz competitions are sure to tease the tired brains of the old boys! Once again all the very best to those present - espically Jimmy, Jennifer Chandra and Prema. Dr. B.N. Ranganathan, Old Boy of St. Joseph's College wants someone from the College Alumni to contact him: ranga@execpc.com. Rajeev Gonsalves, President, Tobashi Trading & Finance, 35/2 Spencer Raod, Fraser Town, Bangalore 560005, India, Tel: 91-80-5553478, Telefax: 91-80-5577736, 5543458. Batch of '79, wants to correspond with Old Boys from '79 and any other batch. Dealing/requiring White refined cane sugar, 12,500mt, 100-150 Komsa. ... for details contact Rajeev for more details. The Memorial now also covers those who have died during the Second World War and later wars, although the names are not listed. Wg. Cdr. P.S. Sanadi (Retd) (Old Boy), DGM, Hindustan Aeronautics Ltd., will open the Meet, and Maj. Gen. G.M. Lasrado, VSM, Commandant, Selection Centre South, will be Guest of Honour, Mrs. Meena Lasrado will give away the Prizes. 6.00 p.m. Requiem Mass for deceased Old Boys. Usual Notice: Breakfast Rs.40/ per head Adults only Lunch Rs.60/- per head Children Rs.40/- per head (Under 12 years) (Over Seas Old Boys would have to fork out the figures in $$!! Ha!) Sale of tickets will definately close on Saturday, 6th September, 1997, 5.00 p.m. It is regretted taht last minute requests cannot be entertained. Late comers will be charged Rs.75/- for Adults and Rs.60/- per head after 6th September for Lunch and Rs. 50/- for breakfast. Outstation Old Boys please book in advance. ( Better check with Kuppy, he normally has a few stashed for you late comers ... !!.. Beware of Bootleggers, Blackmarketeers, etc.. you may find them loitering near Widdys!!). The OBA"Warm Up" is on Friday 5th September '97, 7 p.m. onwards at St. Joseph's Boys' High School. Old Boys bring your partners along and warm up with a Welcome drink, Dinner & Dance. Tickets Rs.75/- per head (including dinner), Available at OBA office 11 a.m. - 1 p.m. upto September 3rd.,.. Thereafter tickets @ Rs.75/- without dinner. Special Welcome to Outstation Old Boys ... from ... Minutes of 78th AGM, 8th Sept, 96! ... Since only Jayant Kapadia (Kuppy) could personally remember the guys, he was given the previlidge og welcomimg then : Cyril N Brown (1933); K.P. Jayaram (1940) Madras; Peter J Pinto (1944) Bombay; Ken Coelho (1950) Australia; Fulgence Rodrigues (1955) Goa; Pervez Billimoria (1954) Secunderabad; Bashirbuddin BabuKhan (1959) Hyderabd; Eugene Abraham (1958) Hyderabad; Adolph Abraham (1958) Hyderabad; Vernon Gomes (1959) Trivandrum; Fraser Gomes (1960) London; Dr. U.E. Eapen (1960) Angamally Kerela; K.J. Jose (1959) Cochin; K.V. Nicholas (1959) Kanjirapally; Charlie Vallipappen (1959) Kottayam; P. Jayaker (1962) Theni Tamilnadu; Dudley D'Souza (1961) Palghat; Colin D'Silva, Mangalore; George Mani (1968) Madras; Peter Futardo (1977) Mysore; Vinoo Sequeira (1974) Atlantic - At Sea! ; M.G. Nanjappa (1988) Hunsur Mysore; Rajesh Nagshetty (1988) Madras; Anil Aldrin (1988) Bombay; Ram Prasad Alve (1990) Mangalore; Seshkumar Vaitla (1990) USA. "Heartfelt Condolence from the Students, Staff, Managements of St. Joseph's Boys' School and Colleges, and the Old Boys' Association in Bangalore India on the sad death Our Mother Teresa, a Mother to Every Human Being. A Mother of the Poor, A Mother of the Sick, A Mother of the Lonely, a Mother of the Unborn, May God's Strength be with You All through this time of Grief and Always. Mother's Spirit is with you and with us all. Mother Teresa was a Living Saint, now she has gone ahead to Pray for all those she worked for. " This is the last communication Mother Teresa had with Fr. Ronnie Prabhu, sj. Special thanks to my friend Brian Morris of Canada, for bring across some software that I can use to better my home pages... benefits for being an ardent old boy eh?! I will start soon. Also thanks to Cary for special deliveries!! Many old boys may have had their beginings atSophia High School or their wives or girl-friends may have been from there, do check out my homepage on Sophia's and send yr comments, Ron. Old Boy's from Sophia High School visit your old school! St. Joseph's had a "Josfete '98" on 31 jan/1st feb '98. Sorry I did not go so I carnt tell anything. Also no photos, he!he! No sponsor! Akshai Mallappa thanks for your effort. Come to think of it, I have more than 600 pics of Bangalore and around, all from my own resources, and it could cost really something. My wife reminded me that the "Net" is not everything, but a "Net+sum" can make a difference!! Don't worry guys, will carry on as long as I can. So far so good, I think March '98 would be crucial in my work environment, with the change in the IT industry, and my work contract being renewed, hopefully! Sorry, the latest, September 2000, and I am on my own trying to make a living, anyone interested in developing a webpage? I could help! this is to formally warn u that ur position as one of the main fighures involved in the online publicising of SJBHS, (or so i presume) is being trethned by, ME. u r just an old student who has 2 things over me, funds and experience, but thats not gonna stop me from beating you, because i hav a secret weapon, my age, im yong enough to write what i feel whil i am in skool, instead of writing what i felt while i was in skool. so, old guy, EAT MY DUST. Ps, guys is this what the present boys of St. Joseph's think of the 'Old Boys'? I guess it's the way they are made to think of the school by their peers and present staff. ..., ofcourse, I did take up the challange, and replied accordingly. Am I fighting windmills?!! Ronnie. Ron's New e-mail: ronniejohnson@vsnl.net (or) ronniejohnson@hotmail.com"